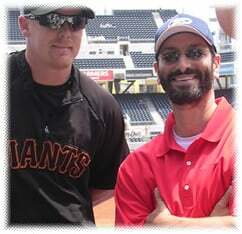 Major League catcher, Steve Holm, and Marc at Petco Park, San Diego. For sports agent Marc Kligman, a regular broker of six or seven figure contracts and endorsement gigs for his clients, the combination of strong work ethics and Jewish observance has turned out to be the ultimate grand slam. The 6'1" attorney with a beard and black velvet kippah not only helps his players negotiate contracts and develop marketing and public relations strategy, he also plays other significant roles on their playing field – that of a shrink, rabbi, and watchful big brother. "You should hear my phone calls. I do more psychological counseling than lawyering," said Kligman, who represents 65 major and minor league baseball players and several 'Division I' baseball coaches. Being an observant Jew distinguishes Marc from the fray"The baseball season can be such a grind for players. It's a long season with a lot of pressure," he said sympathetically. "Chassidus has helped me counsel my guys and pick them up more than I ever imagined. [When they are stressed out] I tell them, 'Everything is a test. You are never given a test you can't handle. You do your part and G‑d will take you the rest of the way.' These words of truth resonate." In a highly competitive business where older and more experienced agents are wining and dining young and often fickle players to lure them from their current agents, the 40-year-old father of three boasts something unique: "I'm a lot different than the other guys out there," he quips. "For starters, I look like a rabbi." In fact, on more than one occasion, Kligman has schlepped players to kosher restaurants across the USA. He also has to inform clients that while he can be reached at most times on his cell phone, he doesn't take calls on Shabbat. In addition, he tells them there are certain games that he can't attend, such as those that fall out on a Shabbat or holiday. He recalls how one of his clients, Mike Zagurski of the Phillies, was called up for his Major League debut on Shavuot of 2007. "He called and left a message or two on my cell phone, not realizing it was a major holiday." Brett Harker, another Kligman client and a friend of Zagurski, called Kligman's secretary, pleading with her to contact Kligman immediately with the good news. "She explained to him that I wasn't going to answer the phone, so he suggested she drive to my house and inform me of Mike's new status as a Major Leaguer." "They want someone who has strong convictions and ethics and won't leave when things go bad"Such "inconveniences" don't necessarily deter players for signing on with him because being an observant Jew distinguishes him from the fray. "It's a great built-in filter because it weeds out the shallow guys. The guys who sign with me have depth to their characters and souls. They want someone who has strong convictions and ethics and won't leave when things go bad. I get a lot of religious – Protestant, Catholic and Mormon – guys who can relate to someone who believes in G‑d, the idea of a master plan, and that what we do in this world matters." Kurt Yacko, a minor league baseball player for the Colorado Rockies, signed with Kligman just before the 2008 draft. "One thing that stood out while we spoke was the fact that he was a religious Jew, and didn't seem to mind that I was a practicing Catholic. In fact, much of our conversation that night was about faith. It was a conversation based on tolerance, acceptance, and spiritual beliefs. This conversation was definitely not what I was expecting from a potential agent. But it was refreshing to know that he was a man of character, faith, and morality, which resonated deeply with me. I spoke with a few other potential agencies and agents but we just didn't seem to have the connection Kligman and I shared." Baseball is in Kligman's blood. Growing up in a Conservative Jewish family in Stamford, CT, he recalls how he and his brother Rob were always "shooting hoops" or throwing around a ball. He earned 10 varsity letters in high school for football, basketball and baseball. As a college student at Johns Hopkins University, he played varsity baseball while earning a degree in both International Relations and Hispanic and Italian Studies. During law school at Tulane University in New Orleans, he became more interested in Judaism. Although he had attended a Jewish day school as a child, his family didn't practice much Judaism at home so he never took religion seriously. At Tulane, he was invited by a fellow law student, David Smith, to join him at a Shabbat dinner at the home of Chabad rabbi Dr. David Kaufmann. Kligman grew close to the Kaufmann family and the Tulane University Chabad community, who inspired him to look deeper into Judaism. "He [Kaufmann] invited me to a few Friday night dinners, put on tefillin with me, taught me some Torah and pretty soon, I was hooked," he recalled. Kligman took on Jewish observance slowly, over a period of years. Upon relocating for his first job to San Diego, Kligman began keeping Shabbat and a kosher home, then eating completely kosher followed, and ultimately, wearing a skullcap full time. His lifelong dream was to combine his legal career with his love of sportsNow, he and his wife, Leah, send their children to Chabad Hebrew Academy near their San Diego home. He has been involved with Chabad of University City in San Diego for the last 14 years and reads the Torah for them regularly. He finds time to teach a Sunday morning Torah class to fellow Krav Maga students, and founded a "Monday Lunch and Learn" at a local San Diego kosher restaurant that's been going strong for five years. As his Jewish observance evolved, Kligman's professional life began thriving. He opened a private criminal defense practice shortly after graduating Tulane Law School. But his lifelong dream was to combine his legal career with his love of sports, and in 1998, he founded Total Care Sports Management. His practice began with three clients but, soon, word of his honesty, diligence and close attention to clients eventually spread among players. He soon attracted a larger team, including household names such as Carlos Ruiz of the Philadelphia Phillies, who led the Phillies to two consecutive World Series appearances – including the 2008 Championship – since signing with Kligman ten years ago. Despite his success in the business, Kligman remains humble and grounded. "When I have ten household names, that will be a milestone," he shrugged. "My business is so unpredictable – you don't know what the future holds. You have to trust that G‑d is guiding you the right way. I've had guys stolen from me. I've had guys leave me. Some of them fizzled out anyway. I have faith that everything that happens is for the best." Deena Yellin is a New Jersey based newspaper reporter who has written for The New York Times, Newsday and The Jerusalem Post. She recently contributed to an anthology called Bread and Fire: Jewish Women Find G-d in the Everyday (Urim Publications).